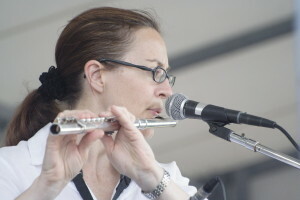 Colleen is an accomplished jazz musician whose talents are in great demand in Toronto. Ms. Allen graduated from the renowned Humber College Jazz Program where she studied with the likes of Pat Labarbera and Mike Murley, two of Toronto’s top jazz musicians and teachers. Colleen sites as important influences on her approach to the saxophone, Jan Garbarek, John Coltrane and Cannonball Adderley. Having been a part of the Toronto music scene for more than a decade, Colleen has performed with many of Canada’s top pop and jazz musicians: Gino Vanelli, Rik Emmett, Lorraine Segato, Rita MacNeil, Anne Murray, Projecto Urbano, Alex Leifson, The Parachute Club, Holly Cole, Molly Johnson, Oliver Sheroer, Shirley Eikhard, David Serada, Susan Hookong, Manteca and David Clayton-Thomas to highlight just a few.